Margarita holds an undergraduate degree from Pontificia Universidad Católica del Ecuador, and two Masters degrees, one from Universidad San Francisco de Quito and a second from Mississippi State University. Margarita has research expertise in herpetology, aquatic ecology and insect genetics, and a deep commitment to conservation of biodiversity in Ecuador. Luis has nearly two decades of experience working in the rainforests of northwest Ecuador, as a specialist in ornithology and ecology. He studied Biological Sciences at the Central University of Ecuador, and has led research projects for several national and international organizations including the Ministry of the Environment, where he currently works. Luis is coauthor of several articles in scientific journals. His interest focuses on community-based conservation and understanding the ecology of Neotropical bird species. A Mache-Chindul native, Fernando holds a degree in Environmental Engineering from the Escuela Superior Politécnica de Manabí. Fernando is an expert ornithologist with over ten years years of experience studying avian populations across Ecuador. He is currently leading projects to document avian diversity and promote conservation in local communities. He has promoted his research through the publication of peer-reviewed scientific studies, as well as presentations at international scientific meetings. Domingo is a highly respected local resident that lives in the Mache-Chindul Reserve, northwest Ecuador. Domingo has worked with FCAT since 2004, with a focus on scientific research and community outreach. He is an expert in plant, seed and fruit identification and in the reproductive phenology of the palm Oenocarpus bataua and other plant species. He has disseminated the results of his research via several peer-reviewed publications and presentations in international scientific meetings including at the annual Ecuadorian Ornithological Society’s annual meeting in 2015, where he won a prize for ‘best presentation of the conference. Jordan lived in Ecuador 2001- 2005 and helped to found FCAT. He is currently an Associate Professor in the Department of Ecology & Evolutionary Biology at Tulane University, and he contributes scientific expertise to FCAT and assists with fund-raising and strategy. He has published over 50 peer-reviewed articles and his community engagement work has been recognized by the Ernest A. Lynton Award for the Scholarship of Engagement for Early Career Faculty and the Biotropica Award for Excellence in Tropical Biology and Conservation, among others. Jorge is a highly respected local resident in the Mache-Chindul Reserve and a core member of FCAT since 2003. Jorge is passionate about field biology and community conservation, with a broad expertise that includes radio-tracking, camera trapping and avian observation. His research focuses on the endangered long-wattled umbrellabird and the frugivory and dispersal of palm communities. 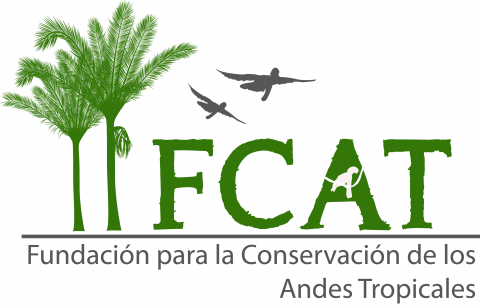 Jorge has received the ‘Conservation Hero Award’ from Disney World Wildlife Conservation for his work with FCAT, and has disseminated the results of his research via peer-reviewed publication and presentations in international scientific meetings, including the ‘best presentation award’ at the IV meeting of the Ecuadorian Ornithological Society. Monica completed an undergraduate degree in Ecology and Environmental Biology Education at Universidad Central in Ecuador, and is currently studying for a MS degree with a focus on climate change. She has more than two decades of experience in Environmental Education in Ecuador, including 10+ years of work in the Mache-Chindul Reserve. Her groundbreaking work has been recognized internationally by the Whitley Fund for Nature and the National Geographic Society as well as nationally by the Ministry of Education and Culture, Ministry of Environment, and local residents. Dr. Gonzalez has managed large projects in the past and has experience in environmental management. Beto is a highly respected local resident in the Mache-Chindul Reserve that started working with FCAT in 2014. He has co-authored one paper related to diversity of nocturnal birds, such as owls, in forest fragments and was also awarded for the ‘best student paper’ for this work at the IV meeting of the Ecuadorian Ornithological Society. Beto has continued expanding his skill set, and his versatility and flexibility are critical to FCAT’s research scientific projects and community outreach projects. Zoë is a current PhD candidate in the Ecology and Evolutionary Biology Department at Tulane University, and her thesis research investigates the how a widespread palm species may be influenced by habitat alteration and a changing climate. She has worked with FCAT since 2014 on both research projects as well as community based conservation. She is currently involved with helping local residents develop ecotourism destinations in the Mache-Chindul Reserve. Luke holds a doctorate in Ecology and Evolutionary Biology from Tulane University, and is a postdoctoral researcher at the La Kretz Center for California Conservation Science at UCLA. His thesis work focused on the ecology and evolution of plants in Ecuador and has contributed substantially to the efforts of FCAT. Since 2011, Luke has led scientific projects with FCAT and has shared his results with the broader scientific community through publications and meetings and also with local residents of the Mache-Chindul Reserve through informational pamphlets.